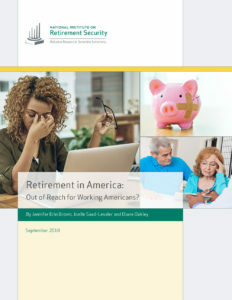 WASHINGTON, D.C., SEPTEMBER 17, 2018 – A new research report finds that the retirement savings levels of working age Americans remain deeply inadequate despite economic recovery. An analysis of U.S. Census Bureau data reveals that the median retirement account balance among all working individuals is $0.00. The data also indicate that 57 percent (more than 100 million) of working age individuals do not own any retirement account assets in an employer-sponsored 401(k)-type plan, individual account or pension. The analysis finds that overall, four out of five working Americans have less than one year’s income saved in retirement accounts. Also, 77 percent of Americans fall short of conservative retirement savings targets for their age based on working until age 67 even after counting an individual’s entire net worth – a generous measure of retirement savings. Moreover, a large majority of working Americans cannot meet even a substantially reduced savings target. Growing income inequality widens the gap in retirement account ownership. Workers in the top income quartile are five times more likely to have retirement accounts than workers in the lowest income quartile. And those Individuals with retirement accounts have, on average, more than three times the annual income of individuals who do not own retirement accounts. These findings are contained in a new research report, Retirement in America | Out of Reach for Most Americans? The report is issued today by the National Institute on Retirement Security (NIRS) and is available here. A webinar to review the findings is scheduled for Thursday, September 20, 2018, at 11 AM ET. Register here. The retirement savings shortfall can be attributed to a multitude of factors and a breakdown of the nation’s retirement infrastructure. There is a massive retirement plan coverage gap among American workers, fewer workers have stable and secure pensions, 401(k)-style defined contribution (DC) individual accounts provide less savings and protection, and jumps in the Social Security retirement age translate into lower retirement income. The catastrophic financial crisis of 2008 exposed the vulnerability of the DC-centered retirement system. Many Americans saw the value of their retirement plans plummet when the financial markets crashed and destroyed trillions of dollars of household wealth. Asset values in Americans’ retirement accounts fell from $9.3 trillion at the end of 2007 to $7.2 trillion at the end of 2008. The economic downturn also triggered a decline in total contributions to DC retirement accounts as many employers stopped matching employee contributions for a time pushing total contributions below 2008 levels. Since then, the combined value of 401(k)-type accounts and IRAs reached $16.9 trillion by the end of 2017. Unfortunately, this increase in total retirement account assets did not translate to improved retirement security for the majority of American workers and their families who have nothing saved. In this uncertain environment, Americans face an ongoing quandary: how much income will they need to retire, and can they ever save enough? To maintain their standard of living in retirement, the typical working American needs to replace roughly 85 percent of pre-retirement income. Social Security, under the current benefit formula, provides a replacement rate of roughly 35 percent for a typical worker. This leaves a retirement income gap equal to 50 percent of pre-retirement earnings that must be filled through other means. Account ownership rates are closely correlated with income and wealth. More than 100 million working age individuals (57 percent) do not own any retirement account assets, whether in an employer-sponsored 401(k)-type plan or an IRA nor are they covered by defined benefit (DB) pensions. Individuals who do own retirement accounts have, on average, more than three times the annual income of individuals who do not own retirement accounts. The typical working age American has no retirement savings. When all working individuals are included—not just individuals with retirement accounts—the median retirement account balance is $0 among all working individuals. Even among workers who have accumulated savings in retirement accounts, the typical worker had a modest account balance of $40,000. Furthermore, some 68 percent of individuals age 55 to 64 have retirement savings equal to less than one times their annual income, which is far below what they will need to maintain their standard of living over their expected years in retirement. Three-fourths (77 percent) of Americans fall short of conservative retirement savings targets for their age and income based on working until age 67 even after counting an individual’s entire net worth—a generous measure of retirement savings. 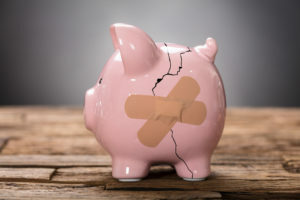 Due to a long-term trend toward income and wealth inequality that only worsened during the recent economic recovery, a large majority of the bottom half of Americans cannot meet even a substantially reduced savings target. Public policy can play a critical role in putting all Americans on a path toward a secure retirement by strengthening Social Security, expanding access to low-cost, high quality retirement plans, and helping low-income workers and families save. Social Security, the primary underpinning of retirement income security, could be strengthened to stabilize system financing and enhance benefits for vulnerable populations. States across the nation are taking key steps to expand access to workplace retirement savings, with enrollment in state-based programs this year starting in Oregon, Washington and Illinois. Other proposals to expand coverage are on the national agenda but universal retirement plan coverage has not become a national priority. Finally, expanding the Saver’s Credit and making it refundable could help boost the retirement savings of lower-income families. To understand the challenges working-class individuals face in retirement, the report provides an analysis of the U.S. Census Bureau’s Survey of Income and Program Participation (SIPP) data released in 2016 and 2017. The study analyzes workplace retirement plan coverage, retirement account ownership, and retirement savings as a percentage of income, and estimates the share of workers that meet financial industry recommended benchmarks for retirement savings.